I have been meaning to reach out for such a long time now and this morning whilst running Judy, I realised it’s almost 3 years since you handed us the most joyful little girl and we drove away from your home. Therefore no time for further procrastinating! Thank you! Judy has enriched the lives of Michael & I, our family & friends in so many ways. She is so intuative, positive, active, caring (our nurse when we’re sick) & resilient. We moved to Brisbane from Melbourne around 7 months ago & Judy was the first to settle into Queensland life. We still run her at each end of the day for an hour & 15 minutes each. 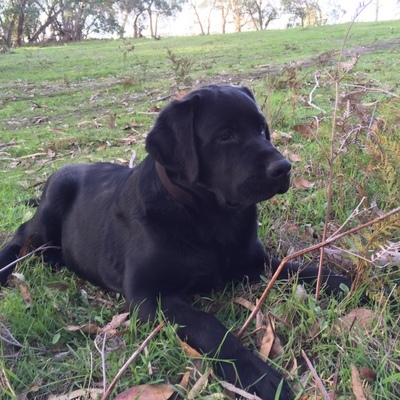 Who needs mindfulness or meditation when you have a Labrador in your life? 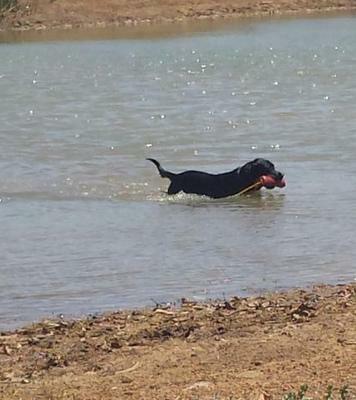 We know there are four main loves for Judy: people (Michael & I), water, retrieving balls & sticks & of course food. We like to kid ourselves that this is the order, but in reality, we know it’s the opposite order! Having said this, she remains a small 24-26kg (a great size) and the vets are amazed to listen to her fit heartbeat. Her energy reminds us of her Dad and in fact, we believe she looks a great deal like him – very handsome, however feminine! We love Judy dearly. My joke is always that she is the love of my life… but don’t tell my husband! Thank for entrusting her to us. My phone is full of photos of this beautiful creature, so attempt to attach some highlights to this email for you to enjoy. thought to take a moment and give you guys some feed back. I just visited your website and was very moved by everything that is there. Apart from your beautiful labs I found your heart and soul. Congratulations to you both for what seems a life time of dedication to our breed with much more to come. 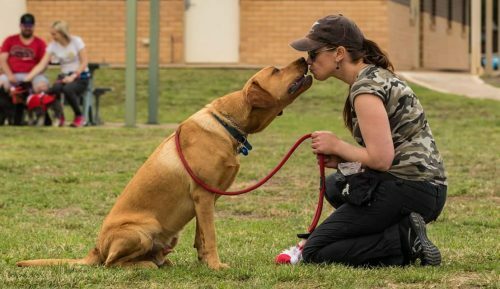 Not only congratulations for the fabulous results you have from working your dogs but for the efforts to improve with your breeding program. And training methods. 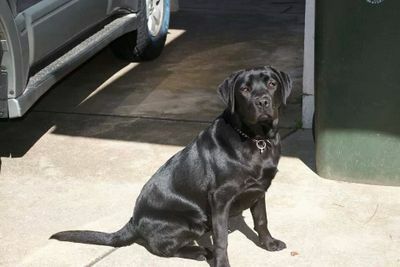 I also breed Labradors but it has only been for a few years. I show my labs. But gosh i have to say that I was truly moved to see your dogs working in the field. I know my dogs are smart and would love that kind of natural activity. May be one day I will venture down that path. I find the show world very competitive and not many will take the time to give a word of praise but I will. I’ve been meaning to email you for some time to update you on how Toby is going. He has settled into the family and is very loved. The kids adore him and never want to be apart from him. 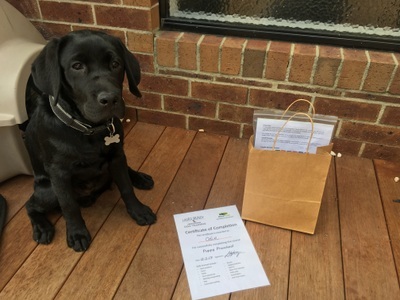 He has completed puppy school and is continuing with obedience training, he is a very trainable pup as he is always keen to work for a treat! He also loves a snuggle! I was particularly impressed very early on when I noticed that he would lock onto the tv if there was any type of bird on the screen- even without any sound he seemed to be able to recognise a bird and was obviously very interested. Prior to this I had thought dogs could not see the picture on a tv very well. 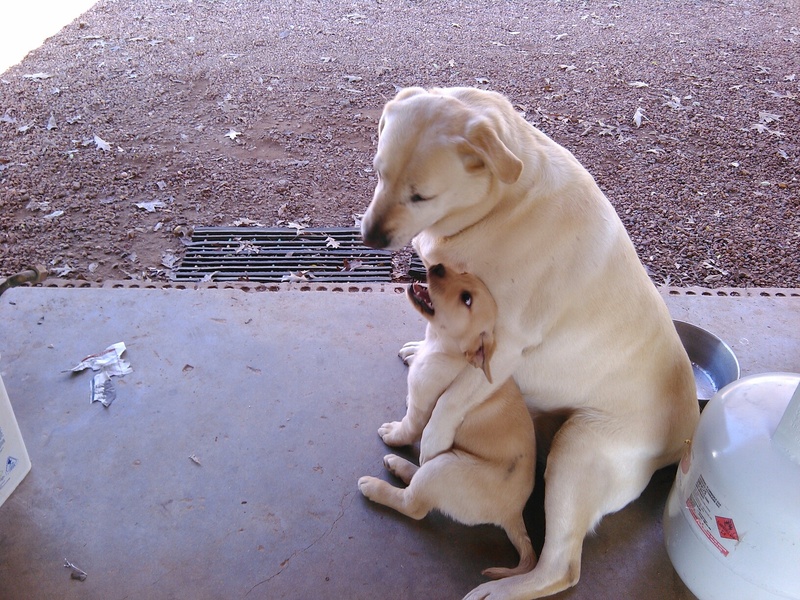 I’ve had a few labs in the past but have not seen this behaviour in any of our other dogs. He also loves the water (which was very evident last night when he jumped in the bath with the kids much to their delight!) Thank-you very much for our lovely boy. If we are ever in the area we will try to call in for a visit. 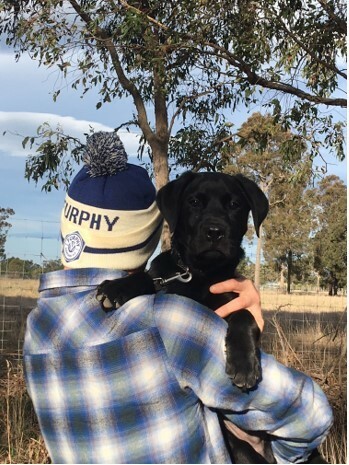 Just a quick email to let you know how Furphy is going! 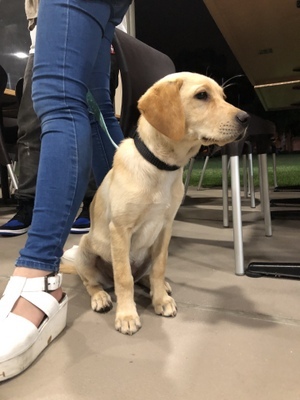 Since the last update he’s graduated from Puppy School, he’s been out and about to cafes, and comes for a ride around town every few days to visit new places, often going for a quick walk around the busy streets. He’s recently discovered water, I don’t think we’ll be having any issues with swimming! He is just so sweet, and he takes everything in his stride. 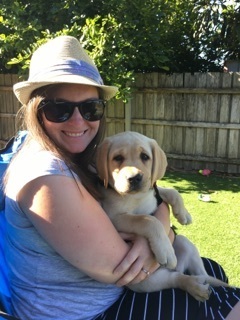 We absolutely adore him, his puppy cuddles are the best medicine! 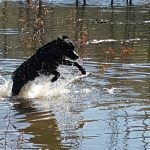 I went and watched my first retrieving trial on the weekend, which was incredible. I had a ball andI think I might have a go at novice/beginner at some point. I’ve attached another photo, I’m hoping to get some decent ones over the next few weeks, which I’ll send through. He is just growing sooooo fast! 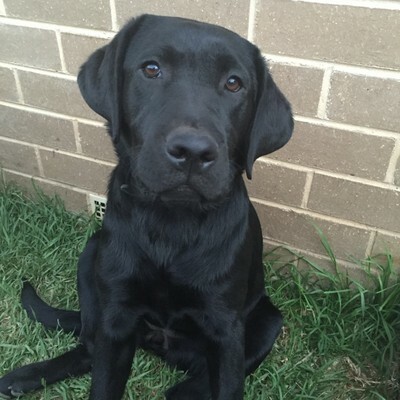 Thanks for Darcy’s registration certificate, it arrived yesterday and I’ve sent it on to Dogs Vic. I’ve attached a couple of photos – we went to Yan Yean Reservoir today, lots of ducks and water birds. Darcy did his usual thing and sat to watch the birds. We also have a lot of birdlife around our house and live under a flight path to Melbourne Airport – Darcy always sits and watches whether it’s a cockatoo or plane. He’s only chased one cheeky magpie who got much too close. Of course this is what he’s bred for, but he never ceases to amaze me. 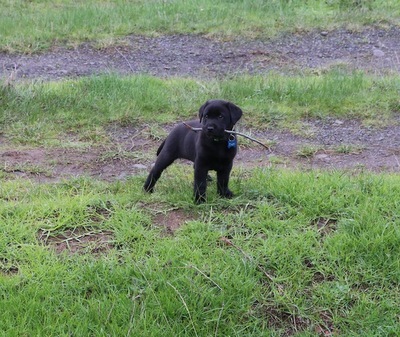 His training is going well, he’s very quick to pick things up and he loves retrieving (again, no surprise to you). 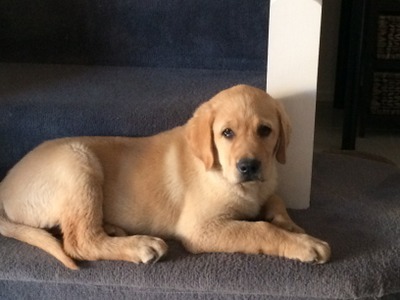 I had meant to email before now to update you on Murphy Boy & to say thank you. 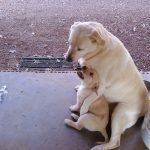 In December of 2016 after a Google search I contacted Karl asking for help in locating a fox red Labrador litter. Karl put me on to yourself Wendy & lucky for me you had a pup returned due to his new family needing to attend family overseas. I picked Murphy up & we have had a blast ever since. He’s such a smart, kind & super playful bundle of cuddles. Top of his class in obedience & this year we will start Rally O. Every morning we are awake at 5:30 for a morning walk, of which he’s only missed a few at 15months old when he was desexed. His favorite meal is coconut oil fried minced chicken & veg omelette. Yes he’s spoilt rotten, but he deserves it & is a typical Labrador at his age, full of energy & always finding a way to please me. Just wanted to send you an update on our beautiful girl Flounder from Georgie and Trappers litter. We absolutely adore her!! She’s doing so well in obedience training and she’s very loved here. Thanks again for such an amazing puppy! Here’s some pictures of her, she’s growing so fast! 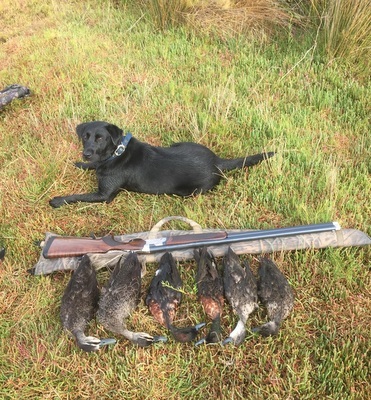 Hi Wendy & Mark, please find attached some pictures of Storm on his first trip hunting on the rice in NSW, he is a fantastic dog, learns very quickly, gorgeous looking dog, I’m so very grateful I got him, he’s my best mate, love him to death, will call in with him when next I’m in Landsbourgh. 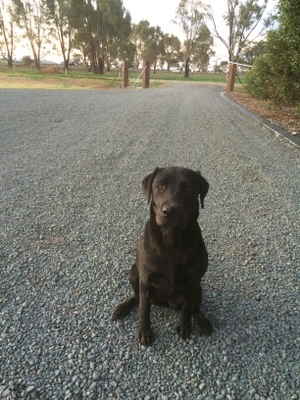 We wanted to send you a big thank you for our beautiful dog Molly. She is an absolute bundle of joy, giving unconditional love, and even greeting us at the door with her wagging tail and a desire for a good pat ? We are so in love with her and love giving her a cuddle every day. She is a very happy girl with the energy of a puppy, but now she has grown into a beautiful bigger doggy. We’d love to share some photos of moments with her to show you how much she’s grown! We love her gold colour and soft coat. She’s been getting the advance dog food as suggested, and is getting a walk with plenty of games of fetch. She loves coming and sitting on her indoor bed, and chewing up her toys ? If you want to see more of our beloved Molly, we’re happy to share some more pictures. Hope all is going well with your house sale and ultimate move.Just a quick update on how our young Elmer is progressing, he is a champion. I’m over 60 years old and have quite a few dogs over those years, this little feller is the best I’ve had. He is so trainable. 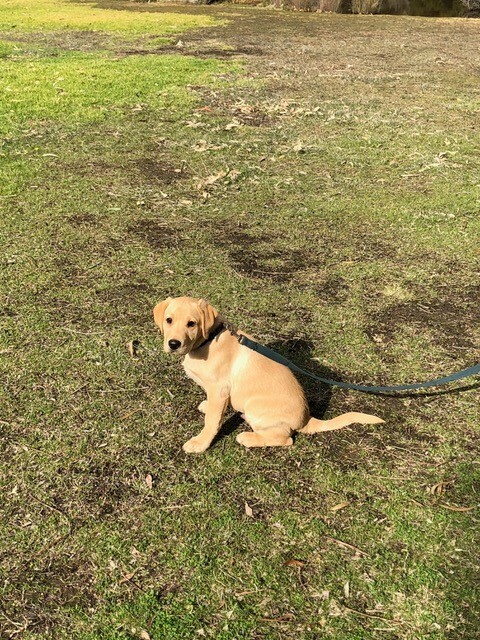 He is just 4 months old and is so easy to train. Thank you, thank you, thank you. 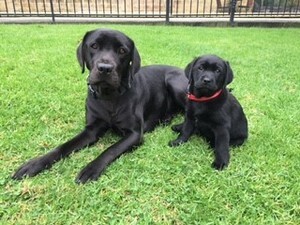 Just thought I’d send through a photo of Smoke now he is really grown up! It’s not the best, it was taken from my mobile this morning as we were playing on the equipment at a local park. Hi Wendy& Mark, just to update you on our dear little Zac. He is a ripper! 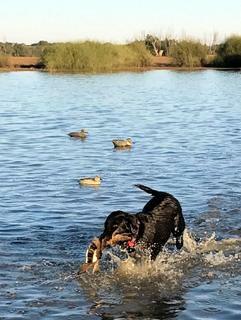 Lives to retrieve and we couldn’t be happier with him. We spend a lot of time walking him after work and on the weekend, for exercise a socialization. 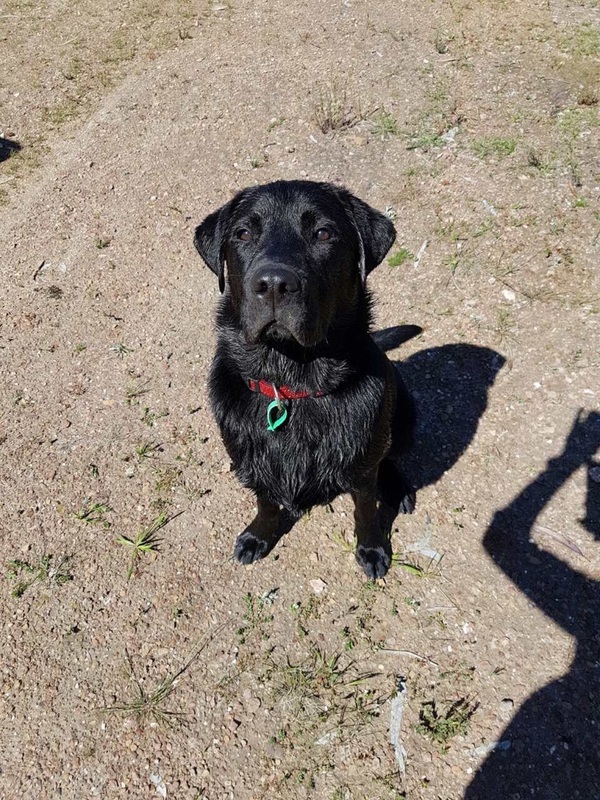 He loves Vic Park and took a dive in off the deck into the dam yesterday, he went under and popped up to find the lure! OMG he loves to chew and eat! 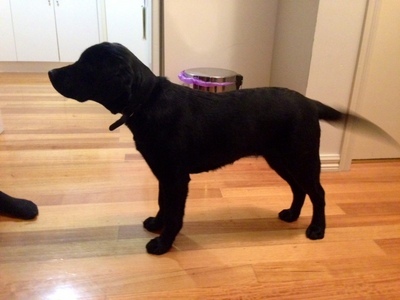 We are still giving him Black Hawk and also kangaroo for healthy variety, his coat is glossy! He is also well wormed and has flea protection, he loves the bush and has no fear of the gunshots. 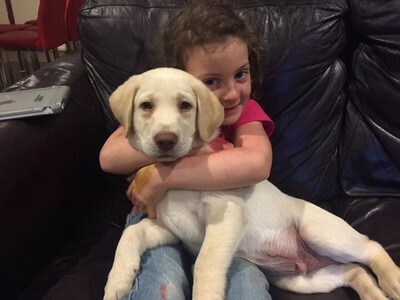 Leigh adores him, he say’s he is the best dog he has ever had, he is so affectionate and loves a cuddle. So all round it is a very happy story and a perfect match for our family. Thank you again so much for our little Zac! I hope you are surviving the cold weather we have been having. Hopefully we are over the worst of the weather. 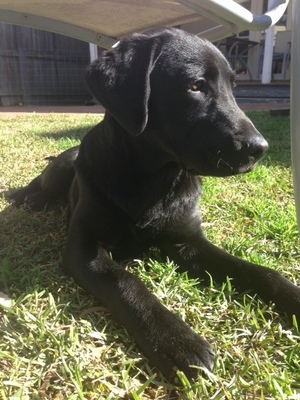 “Oz” the Black Male Labrador I purchased from you is now 8 months old and I have taken a couple of pics of him for you. He has developed very fast and is fit and strong. I am also happy with his looks and he has a particularly attractive head – you may remember I was after a blocky (boof) head. As he develops further and fills out, I am sure he will reach his full potential. He has a great temperament and rarely barks which is great. He also loves the water and the bush which is great. 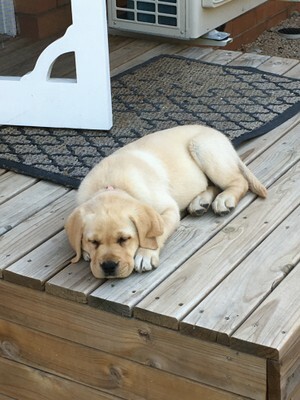 We have called her Sally, after one of our previous labs. 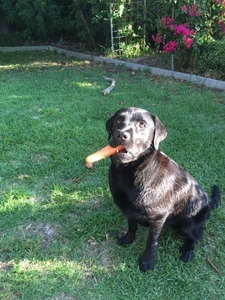 I get her to do 2 – 3 short retrieves a day with a duck wing and she is so keen. She runs flat out and comes back just as quickly very proud of herself. She can also follow a short blood trial of about 2 m as she now knows that she gets to eat the small bit of steak at the end of the track! She is just fantastic and has so much character. 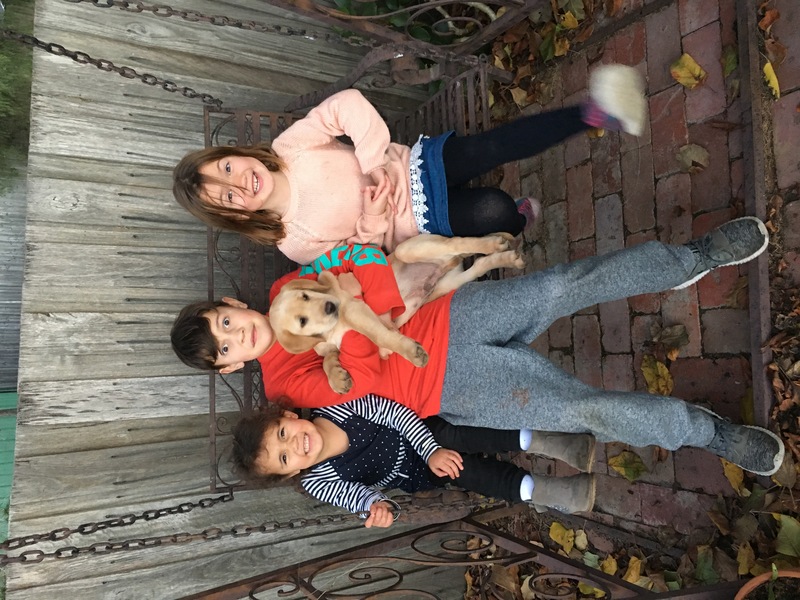 Just a quick email to let you know that our new pup ‘Chachi’ is settling in brilliantly. He cried sporadically during the night for the first couple of days, but is now sleeping right through. He’s a bundle of energy, very responsive and so clever – both Andrew and I are absolutely besotted! 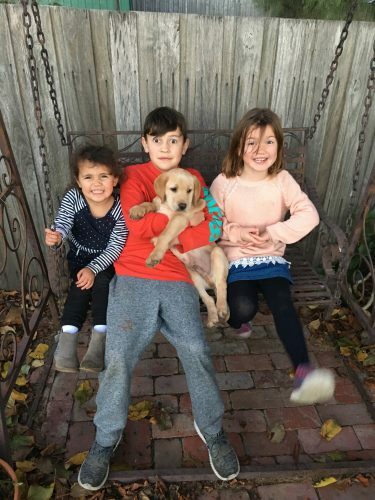 Thanks again for our amazing dog! We hide his food bowl and he has to find it before each feed. I can no longer find hiding spots. His sniffing ability surpasses our hiding spots. Top of the clothes line worked for about 3 minutes. Just thought you may like to see a recent picture of Kobe. He has been an absolute joy! He is such a happy boy, loves his trips to the park, plays well with all the other dogs and looks forward to his nightly visit inside the house. The kids adore him and he adores them. 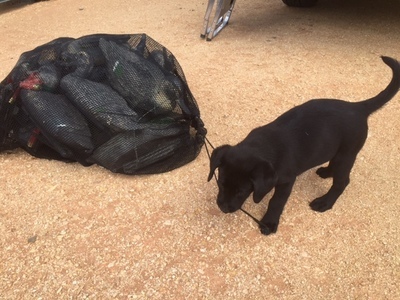 People talk about puppies being a pain and such hard work- not if you get the right dog! People at the park are amazed at such a young dog being so well behaved and want to know where we got the “special” dog whistle as it works a treat . Just letting you know that little ‘Asha’ has settled in beautifully. She calmed down within minutes after we left your place and she slept the whole way home. I can’t believe how confident she is in a brand new environment. She slept outside all night and didn’t make a sound, we even copped a thunder storm but it didn’t worry her at all. Thank you so much, I’m absolutely wrapped with her. she is a dream so far. 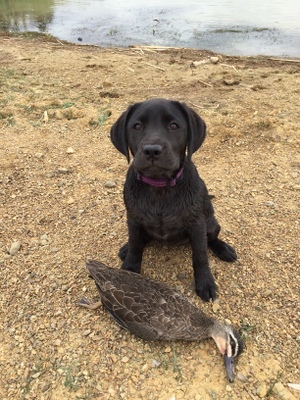 After months of training,this was Chloe’s 1st hunt. She was a joy to watch in full flight. Many thanks for my great companion. 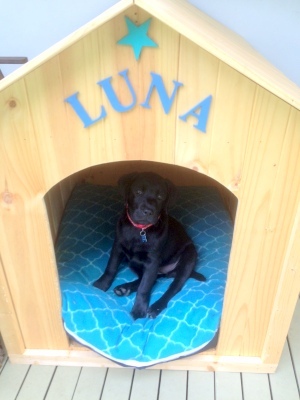 We wanted to provide you with an update about our beautiful girl Luna. She is now 15 weeks old & we couldn’t be happier. She is just over 10kg and is absolutely beautiful. Her coat is so shiny & she receives many compliments about her gorgeous face & beautiful nature. We are amazed by her intelligence & weren’t surprised when she was top of the class at puppy school. Other pups were learning to sit & Luna knew how to sit, stay, come, shake, drop, roll over & crawl, retrieve, All for food of course. As you predicted, she loves to play but equally loves a cuddle & just wants to be near you. She is our little shadow. She’s great in the car & jumps right in on command so we are able to take her on lots of adventures. We have attached a few photos which we hope you like. We couldn’t imagine life without her!! Kelly and I would like to give you an update on Luna. She is so smart and we continue to receive compliments on how smart and good looking she is. She has got traces of scouts coat as we’ve noticed she has got a small amount of chocolate coming through. She loves the water so much. We can’t go for a walk without her finding some water to jump in. 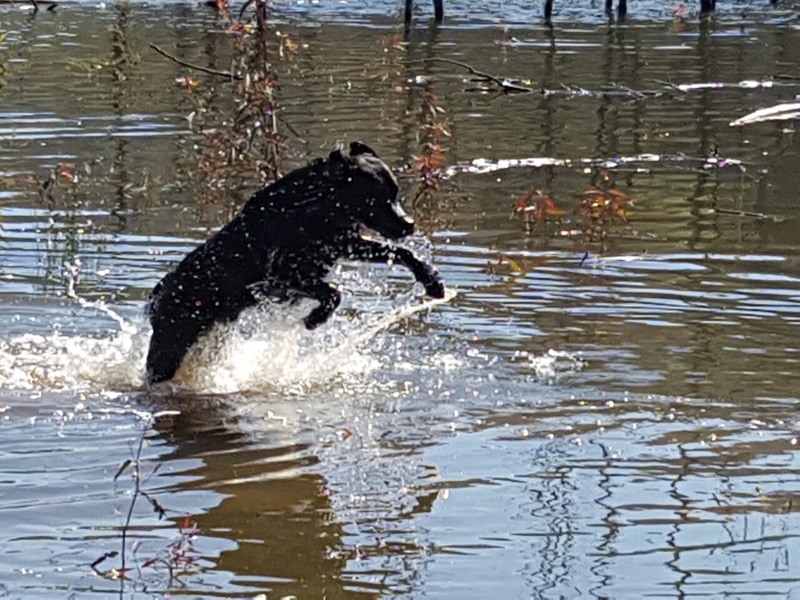 She’s very confident with her swimming where she will try and catch the ducks in the wetlands Behind our house. Kelly and I are also exploring the option of getting her a friend. So we are putting a expression of interest to you where we would like another black either male of female. We think that she would benefit having a friend and they would learn of each other. I’ve attached a picture of Luna. She loves carrots. Well another duck season is underway and I have to say this year, despite being a little bit low in the duck numbers department, will be my most memorable opening of all due to the fact that for the first time I wasn’t alone looking at my watch waiting in anticipation for it hit 7:10am. Instead I was pre occupied with 1, my young fella, excited to be finally out duck hunting with dad in his very first hunt and 2, being absolutely mesmerized by a little black ball of fluff that sat at the edge of the blind not moving a muscle, not even the slightest, eyes fixated on 60 odd decoys. As shots began ringing out around the area he sat there and did not move and as a mob of teal headed our way, a quick blow of the caller, and they were pitching in, two shots two teal, so with a kid screaming “you got them daddy you got them”, with a smile from ear to ear, I look in the direction of the fallen ducks, only to see a eager young Labrador half way out in shallow water making his first retrieve. Well let’s just say I was way wrong because what he brought back or should I say towed back by the cord attached was plastic and probably not really that tasty. I was stumped between what to do I praise him? Or Do I stop him from making a habit of it, so I tied him up I hope I did the right thing anyway because after that he cracked the sulks big time. 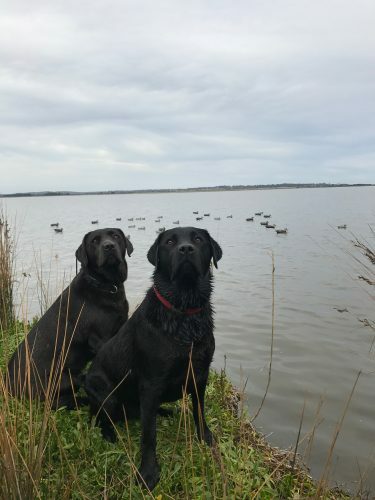 But aside from that he showed great concentration and a natural drive to want to retrieve given I haven’t done to much with him yet and how young he is and you were certainly right Wendy when you said Kody’s pups love the water. I’ve even caught him asleep half in his water bowl. 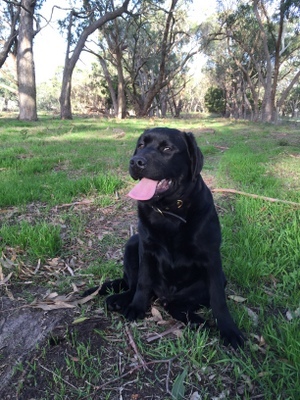 I just wanted to keep in touch and send some photos of our ‘Carlo’ from your Kody / Kupa litter. We adore him, and he has settled into our family beautifully, he is a credit to you and Mark. Just wanted to drop you a line and say how pleased we are with our little Luna! She’s just turned 5 months now and we couldn’t be happier with her. to have around and we’re so glad she’s a part of our family. Thank you for breeding a beautiful dog. Hope your well , I thought I would send you a photo of Lilly , she has an amazing nature and has become a big part of our family . 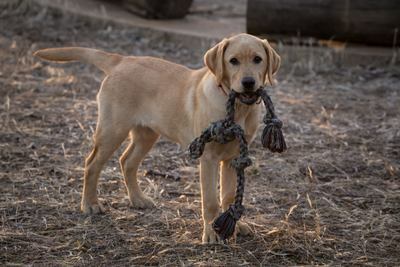 She is very obedient and is retrieving dummy’s and the odd rabbit really well , I haven’t tried her on ducks yet but that’s my next step . 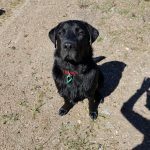 Bear weighs 11.5 kg now and is an absolute delight, he loves chewing and starts puppy school next week.Our cat Bella is warming up to him and brushes herself up against him as she walks past and one time she touched noses with him,he wants to play with her but she is not ready for that as yet. 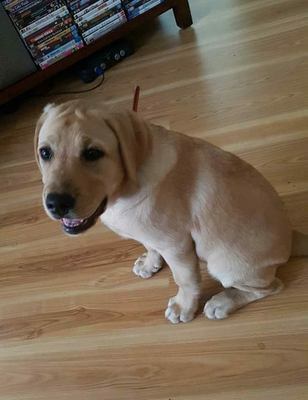 It’s Damian here, just wanted to tell you that our almost 6 month old puppy Nala is doing great. She is the smartest most loving lab We have ever met. 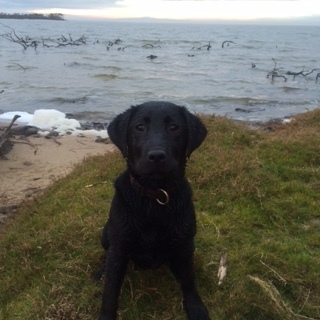 She loves to retrieve, is a very strong swimmer and has an amazing calm temperament. She has started obedience training and she is already so advanced.Our beagle Max has met his true best friend. 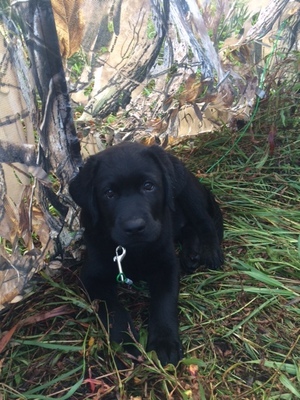 I will be taking her on our first proper hunting trip soon so I can’t wait. I hope the rest of the litter is doing well. Here is a snap of her earlier. 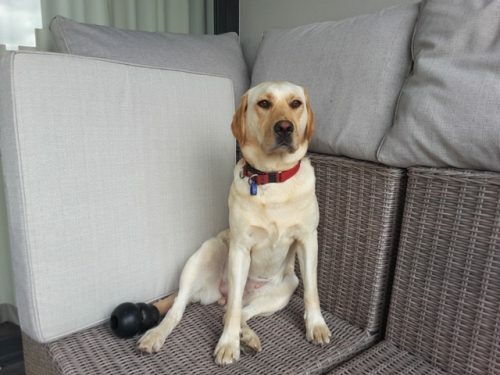 I just wanted to let you know that all is well with our beautiful labrador Gemma. She has proved a wonderful addition to the family; plenty of work, but so much fun. You were right about her colouring. She has a really nice honey gold colour (attached). Just thought I would send a quick update on Buzz! 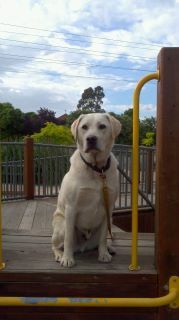 He settled in really well, loves all the cuddles from the kids as much as he likes to play and snuggle up with the cat. He certainly has grown a lot in the last couple of weeks it is crazy how big he has gotten, even has a little bark now. We have started some little training so he knows Sit, Stay and waits for a command to eat. He also loves to retrieve the dummy! Thanks again – he has filled a big hole in our backyard and hearts! I have attached some pics! She has settled in well, Muchie and her are becoming firm friends and have a great time playing together. She is responding really well to her name (apart from her being a complete Labrador at times and ignoring you because she has something better to do). She has learnt sit already and will wait for her food, sitting, while it gets prepared. She has a small walk each day on the slip lead while Much has his morning run. She loves beating up the cats which have accepted her really well given their age (12yo) but she does get the odd bash around the head at times (which doesn’t seem to faze her). Here’s Jasper at 9 ish months. Having a splash at Lake Eildon (Goughs Bay) last weekend. We look on your website regularly with friends and love seeing the new litters. Its been a great week and Stella has really accepted Hilde now. Hilde has settled and sleeps with Josh all night(in his bed). 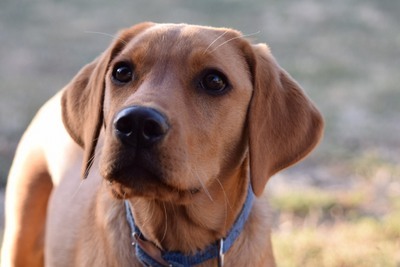 She is a very good girl and brings the whole family a lot of pleasure(apart from the toilet training, but a lot of that is our fault). Thanks and talk soon.